The Resident Evil series has been a long standing franchise full of many fun games and this is no different. Resident Evil Revelations originally came out on the 3DS back in 2012, got an HD port to PS3, Xbox 360, and WiiU later on, and is now making it’s way to the PS4. The graphical updates are clear from the get-go; the cutscenes and gameplay both look great and run smoothly. The use of cutscenes is well done and never feels like they are taking more time than actual gameplay. For a game that originally started on the 3DS, it looks pretty good on the PS4. Unlike the latest Resident Evil game, Resident Evil 7, you take control of your character in 3rd person and will be looking over their shoulder. It’s nice since you get a wider look at your surroundings, but still feel the intimacy of being close to enemies. In the Resident Evil games, that sense of dread and tension has always been important; this setup ensures that you get those feelings. There are plenty of dark places and narrow hallways you’ll be traversing, so make sure to keep on your toes. Enemies can leap out at any moment, whether it be from around a corner, out of a vent, or even falling from the ceiling. In keeping with familiarity, you also take control of fan favorites such as Chris Redfield and Jill Valentine. You start off as Jill with her partner Parker, searching for Chris on a cruise ship called the Queen Zenobia. 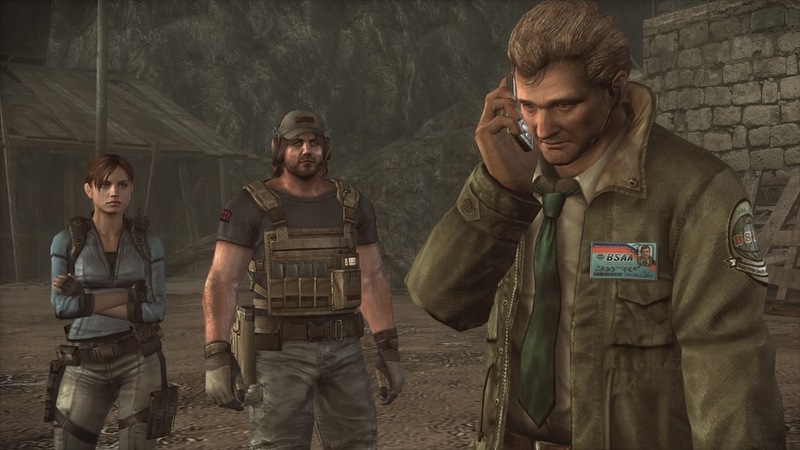 As the story progresses, you will slowly start jumping between characters, which include Chris and Jessica, Parker, and BSAA agents Grinder and Quint. Playing as everyone involved allows the player to experience the story from several points of view instead of just one. In most cases, you will have a partner by your side, which is very helpful. They will actively attack enemies and even kill them, so there’s no need to worry about babysitting a useless AI like in Resident Evil 5. I had many situations where my partner would stun an enemy and open them up for a quick kill. If an enemy is staggered from a critical hit, they will be open for a physical attack. You will see a prompt that you can charge up to do more damage, which helps you conserve ammo. If you hop into the options before you start the game, you can change your control scheme. There are four options: shooter 1, shooter 2, classic 1, and classic 2). The default is shooter 1, which I prefer since it uses L2 to aim and R2 to shoot. Another minor aspect you can change is the color of your reticle when it’s hovering over an enemy. You can choose red, blue, or green; I opted for red because I’m used to a red reticle signifying the enemy. At first, you’ll only start with a pistol, but with some exploring and a keen eye, it won’t be long before you’ve gathered a small arsenal. While you can only carry three weapons at a time, you’ll find weapon boxes scattered throughout the game with your findings. Whenever you pick up a weapon, it will be available at any weapon box, even if you put it back down. In other words, you never have to worry about permanently losing any weapons. You can also find custom parts as you explore; these can be used to improve various aspects of your guns while at a weapon box. Examples include a faster firing rate, higher damage, increased clip size, and more. If you’re worried about finding useful items like ammo and herbs, there’s a helpful tool you’ll obtain called Genesis. It’s a scanner that will make a beep and show a small circle when something is in sight. The caveat is that you must be using the scanner, but it is more than worth the extra few seconds it takes. Genesis can turn an empty corner into a hidden box of 30 bullets. From what I saw, there were a ton of hidden items to find, and they all kept me well supplied. On that note, the game does a good job at making sure you get plenty of ammo; as long as you aren’t wasting all your bullets, you shouldn’t run out of ammo. The Genesis has another neat function as well: scanning enemies. When you scan enemies, a percentage goes up; when this number reaches 100, you get a health item. The percentage carries over and it allows you to build up towards earning health items. On normal difficulty, the game provides a good challenge without being overwhelming. The exception to this is some enemies have one hit kill attacks that can get frustrating if you don’t dodge them. This isn’t enough to ruin your fun however, it’s just another obstacle to fight through. Once in awhile, the gameplay changes to mix it up. For example, there will be some swimming sections where you can’t really fight back and a couple “action-gunner” sections that make you feel powerful. These parts help keep things interesting, especially since there’s a good amount of revisiting areas. The campaign is broken up into 12 episodes and subsections of those episodes. Other than auto-saves, you only get to save at the end of each section or episode. The auto-save checkpoints are set up pretty well, so you rarely ever get sent back that far after death. At the start of each episode, a “Previously on Resident Evil Revelations” montage plays, which is a good summary of the plot so far if you need a refresher. If you don’t want to watch it, they left the option to skip it as well. Speaking of story, the plot of the game is very interesting and engaging. You’re not just fighting for your life, you’re also trying to figure out who’s behind the chaos. After playing the campaign, the next step is to check out raid mode. Raid mode consists of various sections of the game split up into their own levels. The goal is to make your way to the end, which is marked by a floating gold emblem that you punch. In addition to finding some items scattered around, almost every enemy you kill will give you a random item like ammo or keys to progress. Before each level, you can choose your character and weapon loadout. Each person has their own advantages for certain guns, so choose accordingly. You earn experience that levels up your character and BP that you spend to unlock better guns, consumable items, and more. The BP that you earned in the campaign is also transferred to this mode, which starts you off with a good amount to spend. Raid mode can be played cooperatively online with another person if you don’t want to take it on alone. This is definitely a great addition to keep the replayability of the game up well past the campaign length. Resident Evil Revelations is another great addition to the franchise. It maintains the survivor-horror feel that the series is known for. The campaign isn't the longest, but it is engaging and well worth the time. Raid mode is fun to go through afterwards and try out different weapons. Altogether a satisfying challenge and a very enjoyable experience that I had a hard time putting down.